Imagine unloading your kayak or canoe and setting up camp on an island in the middle of a mountain lake. A brilliant Carolina sunset reflects on crystal clear water as you finish tying off your hammock. Or maybe you’ve reached a coastal oasis accessible only by your own paddle power. At night, you fall asleep in your tent to the relaxing sound of waves. From the cool waters of Lake Jocassee to the brackish tidal swamps out east, the Carolinas are home to a huge variety of flat water paddling experiences. While many are accessible by day trip, some require a little more time. Here are seven of the best paddle-in campground adventures from the mountains to coast in the Carolinas. 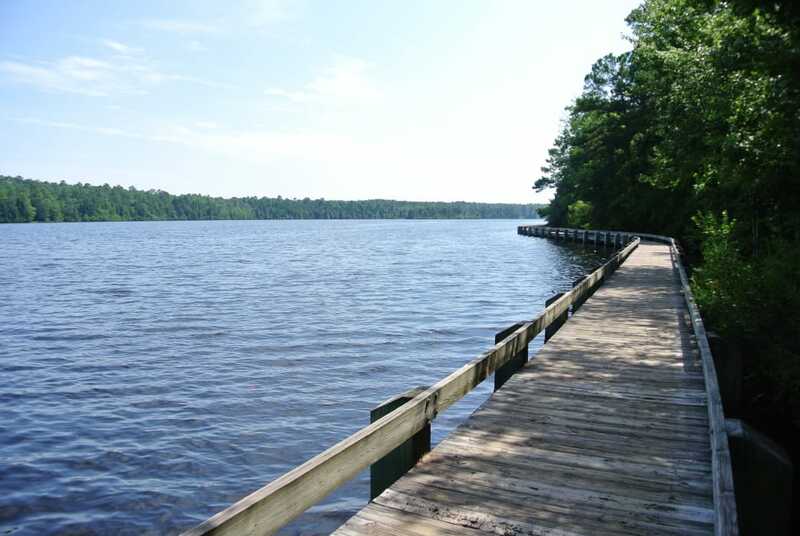 Several trails offer an on-land option to explore Cheraw State Park. through the cypress wetlands of Lake Juniper is an experience every flatwater boater should have, and at Cheraw State Park the experience couldn’t be easier. The $21 per night camping fee for the paddle-in sites comes complete with boat rental and the park even participates in a fishing tackle loaner program. All you need is your standard camping gear. If possible, time your trip during one of the park’s moonlight paddle outings and see the lake in a whole new light. The crystal clear waters and minimally developed shoreline of Lake Jocassee has become a popular retreat in all seasons. Leave it all behind and paddle out to the seclusion of an island campground at Devils Fork State Park. Thirteen sites line the western edge of the island, providing an incredible sunset experience. Basic toilets are available but you’ll need to bring all the other comforts of camping with you—which is a small price to pay for such serenity. 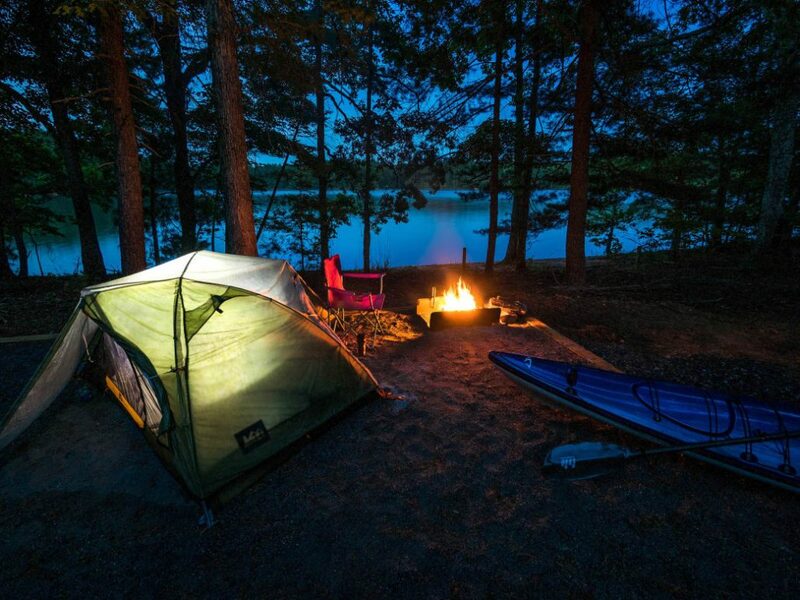 Paddle-in campsites at Lake Keowee-Toxaway State Park offer amazing sunset views. Lake Keowee is an oft-overlooked gem in South Carolina. Just a few miles from its larger cousin Lake Jocassee, the gorgeous surrounds and cool, calm waters of Keowee offer an amazing respite after a long work week. All the sites at the small and quiet campground of Keowee-Toxaway State Park are a pleasant stroll from the lake, but three sit right on the shoreline. You can walk to these sites, but the two-ish mile trek can create a logistics problem when toting all the trappings of a great camping weekend. Instead, load up your canoe and paddle to the site just short distance away from the park’s boat launch. 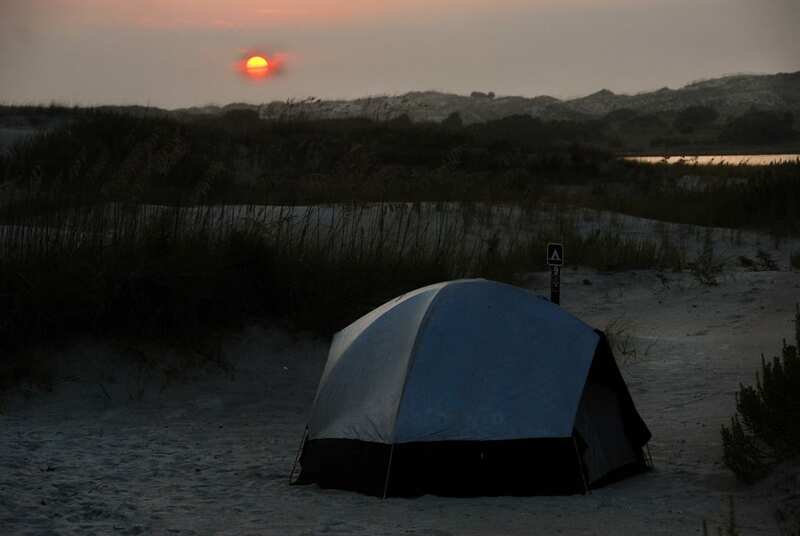 Tucked between huge dunes, Hammocks Beach State Park&rsquo’s paddle-in campground feels both hidden and open to the entire universe. Reaching the row of waterfront campsites on Bear Island requires a paddle across the intercoastal waterway and through the reedy waters of a coastal swamp. What awaits is a pristine, white sand beach buffeted by large dunes and an unfettered view of ocean and sky. Hammocks Beach State Park, which encompasses Bear Island, offers a convenient launch site as well as boat rentals. The campground is rugged but includes showers and bathroom facilities. Perhaps known more for its super flowy singletrack or uber popular lakeside picnic facilities, Lake James State Park is also home to 30 boat-in campsites. These simple sites include only the basics: fire ring, tent pad, and picnic table. While you’ll have to bring in everything you need, including your water supply, a sunrise paddle on the tree-lined lake is well worth the effort. The closest launch to these sites is at the main visitor center in the Paddy’s Creek section of the park. Here they rent kayaks, canoes, and paddleboards—but they go fast. Call ahead to check for availability or bring your own. Weaving through immense cypress trees at Merchants Millpond is an experience every paddler should have. 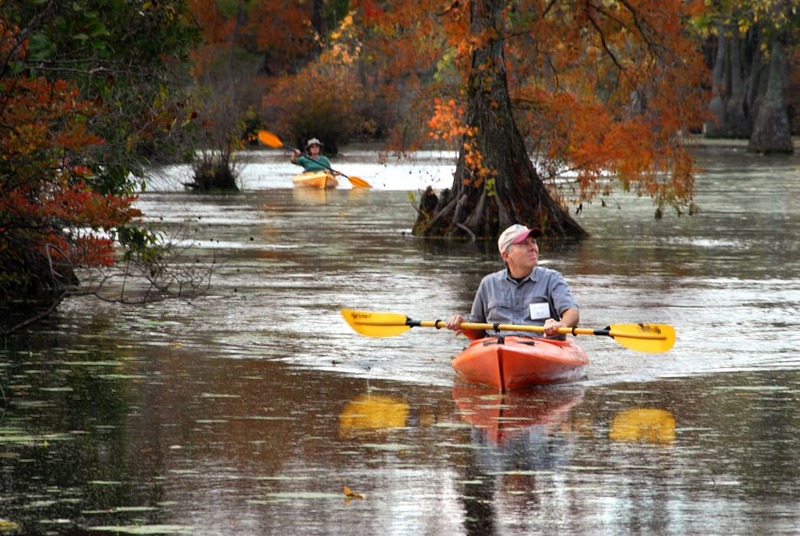 Designated paddle trails in Merchants Millpond State Park flow alongside dense hardwood forests and through stands of immense bald cypress trees. Just beyond the millpond, Bennett’s Creek runs slow and shallow through the low-lying Lassiter Swamp. A water-level exploration of these fascinating biomes is best begun from one of the state park’s paddle-in campsites. The sites are primitive, with only pit toilets available, but the park does offer canoe rentals. Not only is the ironically named New River one of the oldest in the world, it is among the most natural and interesting to explore. In recognition of these properties, the New, which runs through the Blue Ridge Mountains in the northwest corner of North Carolina, is a federally designated Wild and Scenic River. A multi-day exploration of this tree-lined waterway can be done Deliverance-style (minus the, well, you know) by way of multiple canoe-in campsites managed by New River State Park. 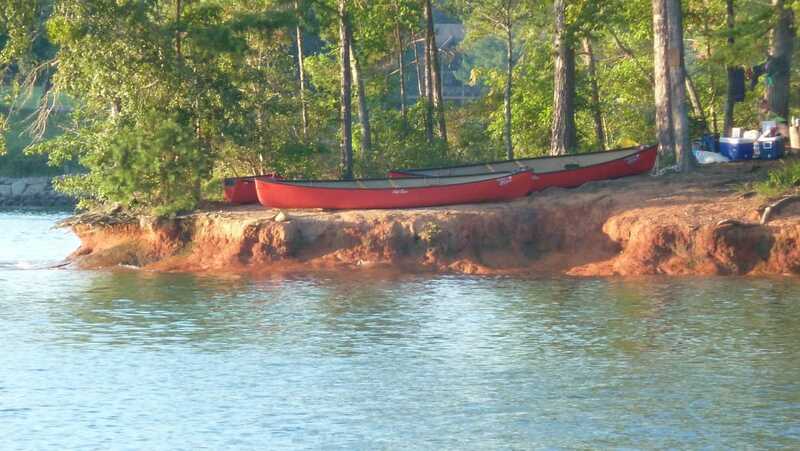 The paddle trip to these primitive campsites is a serene and scenic experience. Although the flow is calm here, it’s important to either know the river; less experienced paddlers should contact Ashe County for a list of local river guides.